Chocolate is my guilty pleasure! I love practically EVERYTHING with chocolate! Did you know a bit of dark chocolate (>72% cacao) is actually very healthy? It provides several minerals and anti-oxidants and it can lower the bloodpressure. So a little bit of dark, pure chocolate is not that bad at all! 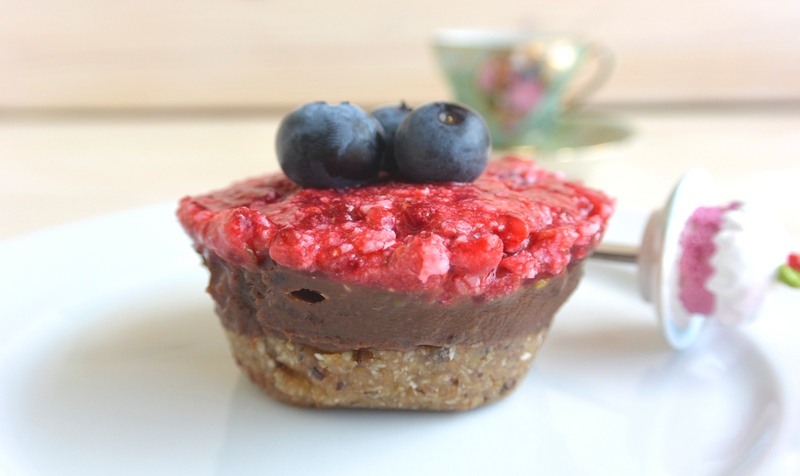 These Raw Chocolate Tarts are not only raw, they’re also glutenfree, dairyfree and free of refined sugar. 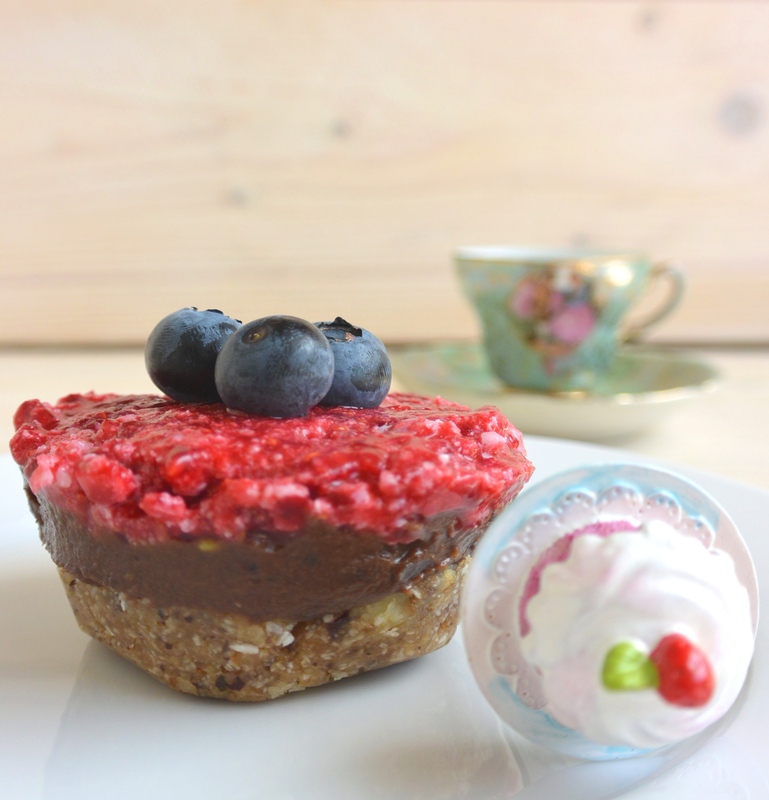 They are great to serve during a party or a high tea! You can make a large tart instead of the mini’s as well. They’re full of healthy fats (nuts, coconut and avocado) and they’re naturally sweetened by the fresh dates so you don’t have to feel guilty when enjoying one of these. Equipement: foodprocessor, handmixer and silicone cups. To make the crust, put all ingredients in a foodprocessor and blend until it’s a crumbly mixture which is a little sticky. Divide over the silicone cups and press firmly into the mold, set aside in the freezer while making the chocolate filling. 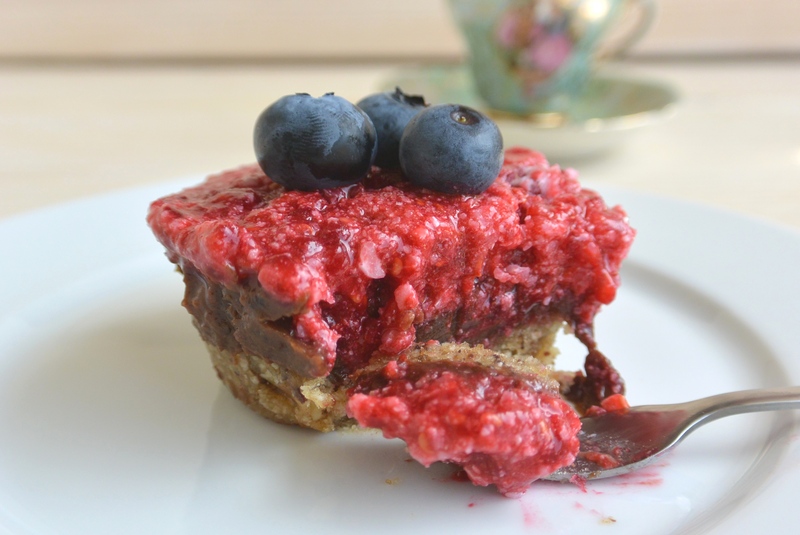 For 4 tart I used 1/2 avocado, 4 dates, 1 tablespoon cacaopowder and a splash of agave syrup. To make the chocolate filling add all the ingredients in a mixing cup and blend until smooth by using a handmixer. Divide the chocolate filling on top of the crust, spread out evenly and set back in the freezer while making the raspberry filling. 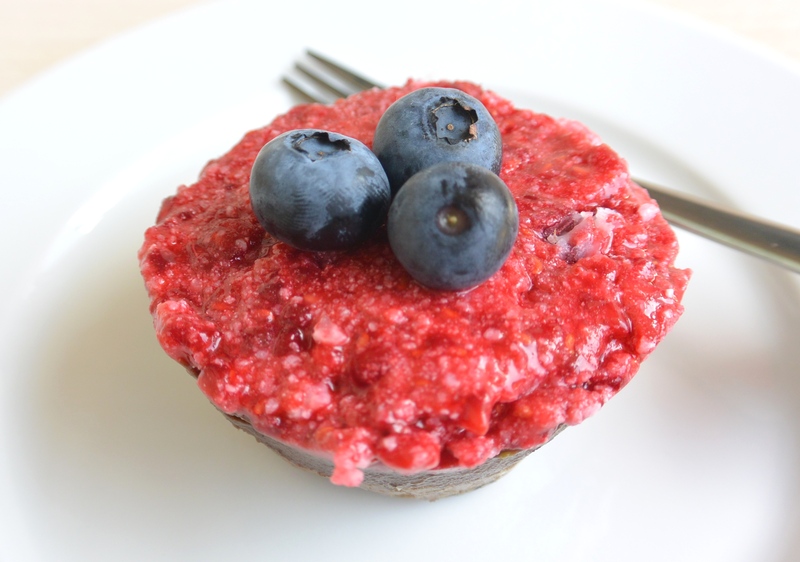 For 4 tart I used a cup of raspberries and 2 tablespoons of coconut oil. 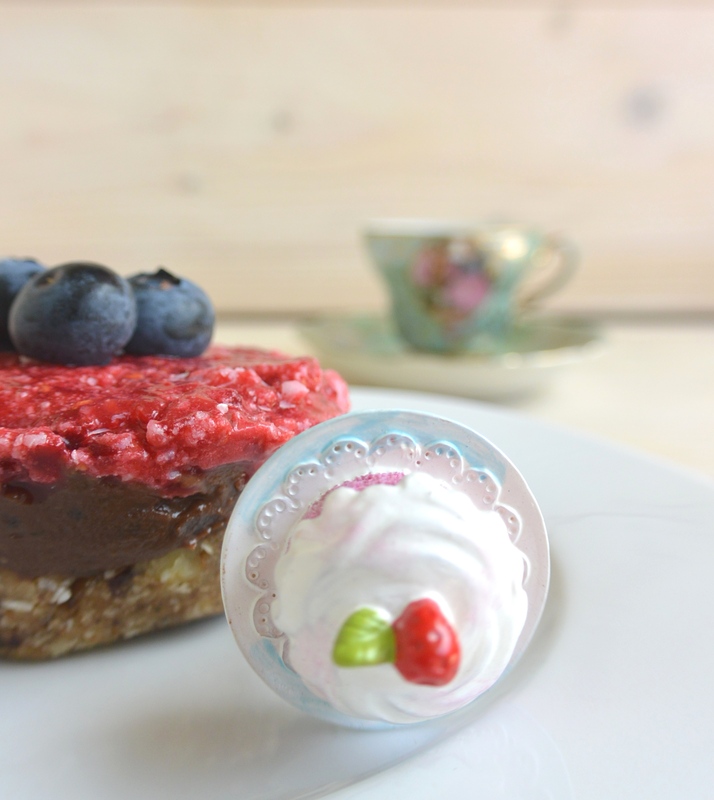 Posted in recipes, Snacks, Sweet Treats, VeganTagged cake, chocolade, chocolate, comfortfood, dairyfree, fit, food, fruit, glutenfree, glutenvrij, healthy, healthy lifestyle, healthy snack, natural, nuts, raspberry, raw, recipe, snack, soyfree, sugarfree, suikervrij, tart, vegan, zuivelvrijBookmark the permalink.